Jointly funded by the National Science Foundation - EAR and NASA - SENH, this project is a collaboration between the University of Idaho, Darwin Research Station, Galapagos National Park, and UNAVCO. The project is unique for several reasons. First of all, data from two different receiver types are being streamed via 900 MHz spread spectrum transceivers using the TDMA (Time Division Multiple Access) protocol. This is the first time the UNAVCO Facility has incorporated multiple receiver types into a TDMA data stream. 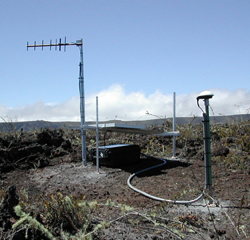 Secondly, the direct (no-repeater) 90 km RF link between the volcano rim on Isabella Island and the Darwin Research Station on Santa Cruz Island is the first permanent, direct, RF data link between these two islands. Lastly, the remoteness, difficult terrain, and harsh weather conditions of the Sierra Negra caldera combined for an exceptionally challenging deployment. The Sierra Negra volcano is the second most active volcano in the Galapagos and has erupted 7 times in the past century, most recently in 1979. Satellite interferometry indicates that Sierra Negra is experiencing some of the fastest uplift rates of any volcano. This permanent GPS network, in conjunction with other volcano monitoring methods, should dramatically improve our understanding of the uplift at Sierra Negra.